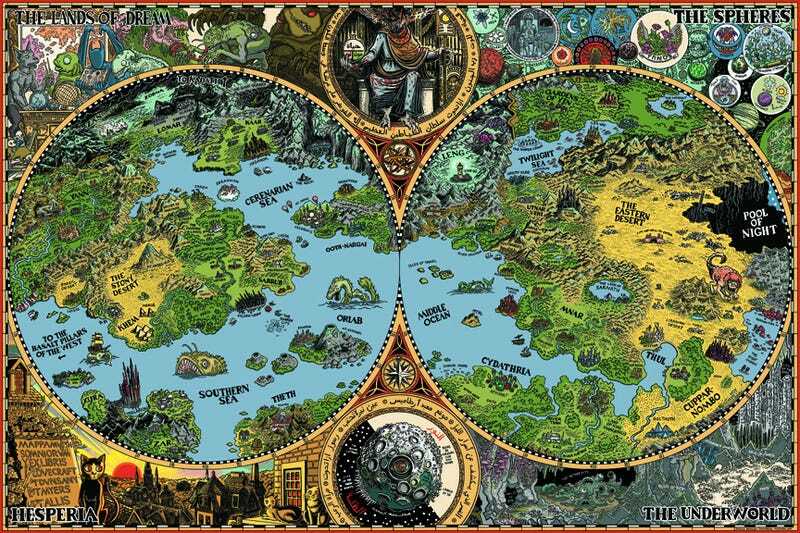 If you look at the beautifully illustrated fantasy maps on posters, in books, and across the Internet and wish that you could make such incredible pieces of worldbuilding, then you're in luck. We have some guidelines for making your maps better, more beautiful, and easier to understand. Top image: Map of H.P. Lovecraft's Dreamlands by Jason Thompson. Jason Thompson, an io9 contributor who has created some truly spectacular D&D maps as well as maps of H.P. Lovecraft's Dreamlands, points out that the very act of looking at a map can fire up a person's imagination. He told us, "You look at a map and this area is waiting for you to go to it. Look at all this land!" "The very act of creating a map, it's like taking a snapshot. You're freezing it in time," he continued. Thompson notes that, in games and fantasy worlds, sometimes the map is treated as the static world. But sometimes, maps can go beyond that. Consider all the wonderful maps — both fan-made and official — that we've seen for A Song of Ice and Fire. We've seen maps that do, in fact, capture a snapshot of the world during the time that George R.R. Martin's series is set. We've seen the history of the world told through a series of political maps. We've even seen a map of the world's geological history. Each of these maps considers the story of Martin's world, but in a different way. Maps can, in some cases, be an instant introduction to the world we're visiting. Consider Keith Thompson's rather spectacular caricature map of Europe, which he made for Scott Westerfeld's Leviathan series. The map gives a clear picture of Leviathan's alternate history and its battle between mechanically minded Clankers and bio-manipulative Darwinists. A map may even convey the way the people of a culture view the world — even if the state of the world itself is in doubt. Consider the fan-made maps based on George Orwell's 1984. This map describes the world of George Orwell&apos;s 1984—or does it? 2. Always keep the viewer in mind. Each time I work on a map or environmental visualization of space I try to keep a triad of fundamental points in mind. In order to be successful, the image needs to satisfy the principal requirements of utility, clarity, and beauty. Will the finished piece provide the information the viewer needs in an understandable manner and inspire their imagination? If any of these three elements are missing, the resulting image will either be unhelpful, unreadable, or ugly. A general understanding of geography, weather patterns, geology, etc. helps quite a bit when designing worlds. Mountains trap rainfall and rivers flow downhill to the sea no matter what world you're developing. Unless, of course, your map rests on the back of a enormous space faring turtle. Then all bets are off. Thompson also agrees that, while a basic understanding of geography is important, not every geographic element on your map has to line up with the real world. "I can assume there's a magical weather pattern that keeps things from being hot and terrible there," he told us. The folks at r/worldbuilding also suggest some fabulous resources to help you create better worlds. For example, if you're working on a map of a city, you might want to check out Kevin Lynch's Good City Form. Often, if you're working with a print book, you have no choice but to work in black and white. But color can do a lot to enhance the look of your map. Want your map to have a storybook feel? Look at illustrations that evoke the feel you're going for, and study their color palettes. Want your world to feel like it comes from a particular era in human history? Look at maps from that same era. Thompson says that sometimes he'll find an antique map that he really likes, and use that map's color palette as a source of artistic inspiration. 5. Look at the work of real-world cartographers. Some of my favorite sources of inspiration are the folks I grew up admiring such as Steven Biesty and the stable of artists that National Geographic relied on for their wonderful article illustrations and fold-outs. Later on, I discovered Daniel Reeve's work on the LotR movie maps and began spending more time with historical cartographers like Al Idrisi and Henry Pelham. Exploration notes like the journals of Lewis & Clark are great creative sparks as well. Also, a huge wealth of inspiration can be found by simply pouring over aerial photo books such as the Earth from Above series. Need to get a better idea of how rivers naturally fan out into deltas? There you go! 6. Break out of the rectangle! Thompson points out a particular pet peeve of his regarding maps in fantasy books. "It has always bugged me," he told us, "that in the maps in the backs of fantasy novels, the world is always vaguely rectangular so that it could fit in the space that's available for the person to draw in." So when you're drawing a country or a continent or a city, just stop and ask yourself: "Am I drawing it this shape because that's the shape of my paper?" Rethink the shapes and angles of your world and remember that, just because your paper is rectangular, that doesn't mean your fantasy continent has to be rectangular, too. 7. Consider embellishments — but don't overload your map with them. Sometimes, maps offer an opportunity to convey more than pure information. In talking about his map of Lovecraft's Dreamlands (featured up top), Thompson says, "The area outside the map is as important as the area inside the map. Putting meaning into all the decorative frills and giving them the same weight, that was really hard, but really fun." Thompson particularly likes maps that convey basic information about the world from a distance, but then offer "meaningful detail up close." There are a number of ways you can do that. On the one hand, you can add heraldic symbols to your map, small illustrations of monsters, representations of events. But you can do it in smaller ways as well, with the style of your legend and compass rose, your font — even simply the way you draw your geographical features. Consider how different Boston, Pittsburgh, and Washington, DC, look when drawn in the style of J.R.R. Tolkien. It's helpful to give maps your own personal flair, but you want to be careful when adding embellishments to your maps, however. Embellishments can be fun and can add valuable information, but you want to keep in mind Schley's admonition to focus on utility, clarity, and beauty. 8. Try different types of maps. Not every map has to show a continent. Stuck in a rut of drawing vast continents filled with forests and mountain ranges? Trying drawing a map of a city or a village. Thompson notes that he doesn't see nearly enough maps representing three-dimensional space — towers and compounds and representations of cities that capture not just their layout but also their skyline. Challenge yourself: see how well you understand different types of space and geography. Even if you don't get it quite right the first few times, practicing different map types and techniques can make you a better mapmaker. There are some wonderful communities for mapmakers on the Internet, places where you can share your maps, get feedback, and see the sorts of maps that other people are working on. There is the Cartographers Guild, a community devoted to mapmaking and helping fellow mapmakers improve their craft. Reddit has communities like r/mapmaking and r/worldbuilding. These are spots where you can get receive critiques on your own maps, see what new styles and techniques other mapmakers are trying out, and find resources to improve both your mapmaking and your worldbuilding. Other people can be valuable in helping you develop your skills. 10. Don't rush! Spend as much time on your map as it needs. The best map makers are accomplished artists in their own right and tend to have a deep interest in how images are crafted, not just what content is going into them. Draw, draw, and draw some more!